Dhaka, 8 Dec, Abnews: All forms of hormonal contraception bring an increased risk of breast cancer, which lasts for about five years after women stop taking it, new research suggests. The raised chance has been known for some time, but it was thought newer forms – such as those which release progesterone only – would be safer. But now a new study, the largest of its kind, has found the combined pill, the progestogen-only pill and non-oral products such as the hormone-intrauterine system (IUS) have a 20 per cent higher risk. Researchers found that among women taking the pill for five years, there would be an extra one breast cancer diagnosis for every 1,500 women. The study, published in The New England Journal of Medicine, analysed 1.8 million women in Denmark who were followed up for nearly 11 years on average. Around two out of three breast cancers are hormone receptor-positive, which means hormones help the cancer cells grow and spread. The risk of breast cancer was higher in women who used the pill or other forms of hormonal contraception, including IUDs, for longer. It was also raised for those who were older – the majority of the cases were in women over 40. Professor Phil Hannaford, who led the research team at the University of Aberdeen, said that the small risks of the pill needed to be weighed up against the benefits. These include not only preventing an unwanted pregnancy but a reduced risk of ovarian, endometrial and colorectal cancers in later life. He referred to previous research that an increased risk of breast and cervical cancer in current and recent pill users which disappeared within approximately five years of stopping oral contraception. 'The similar breast cancer results in both cohort studies suggest that today's pills have similar cancer risks and benefits as older preparations,' he said. The new research, carried out in collaboration with the University of Copenhagen, followed Danish women below 50 years of age from 1995 to 2012. It compared the breast cancer risk in users of different types of hormonal contraception to women who had never used hormonal contraception. During the study period, 11,517 new breast cancers were detected. In current and recent users of any type of hormonal contraception, the risk of breast cancer was 20 per cent increased. There was little evidence of consistent differences in risk between users of combined oral contraceptives with different progestogens. 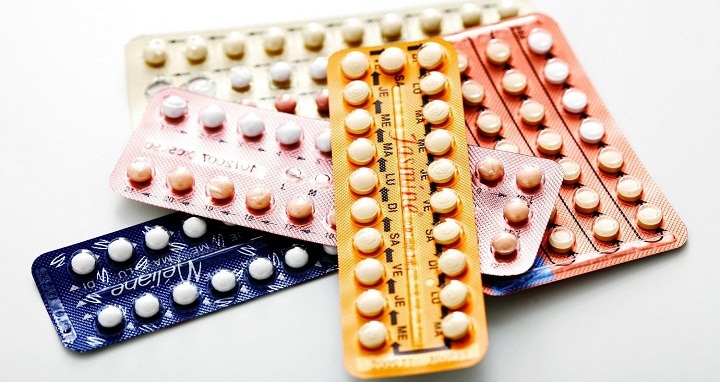 Researchers did not detect an increased risk in former users who had used hormonal contraception for less than five years. The increased risk in long-term users gradually decreased by time and disappeared five to ten years after stopping. Users of progestogen only contraceptives – mainly pills and the hormone-intrauterine system (IUS) – also experienced an increased relative risk of breast cancer. Professor Hannaford emphasised that breast cancer is rare in young women. In this study, the extra risk among women age 15-49 years was one extra breast cancer for every 7,690 women using hormonal contraception for one year. Earlier this year, the world's longest-running study on the issue – The Royal College of General Practitioners' (RCGP) Oral Contraception Study, also carried out by the University of Aberdeen – examined the very long term cancer effects associated with the pill by following 46,000 women for up to 44 years. As well as discovering the risk disappeared within approximately five years of stopping oral contraception, it also found that women who had ever used the pill were less likely to have colorectal, endometrial or ovarian cancer than women who had never used the pill. The benefits persisted for many years after stopping the pill, perhaps 30 or more years. And new cancer risks did not appear as the women got to the age when cancer becomes common. Breast cancer affects around one in eight women in the US and UK. More than 50,000 cases are diagnosed each year in Britain, while over 310,000 new women suffer annually in the US. Eluned Hughes from Breast Cancer Now said the news was an important finding but further research is needed to confirm the link. She also urged women not to panic and reminded them that breast cancer in the under 50s is rare. She said: 'That newer combined contraceptive pills may also carry a slight breast cancer risk is an important finding, and one that will help women make an even more informed decision when choosing to use the pill. 'As a safe and very effective method of preventing pregnancy, for many women the benefits will still outweigh the risks. 'It’s important to keep in mind that breast cancer is rare in women before the menopause, with most women using the combined pill also being in their late teens, twenties and early thirties.